Martina Rau is an Assistant Professor in the Department of Educational Psychology in the area of Learning Sciences and is affiliated with the Department of Computer Sciences. She received her Ph.D. in Human-Computer Interaction from Carnegie Mellon University, and a BA/MA in Psychology from the University of Freiburg (Germany). 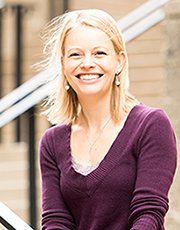 Her research focuses on learning with multiple external representations in educational technologies. She uses a multi-methods approach to integrate learning outcome measures and process-level measures. Instruction in most science, technology, engineering, and math (STEM) domains uses visual representations (e.g., pie charts of fractions; Lewis structures of molecules). While we usually think of visuals as helpful instructional tools, visuals can impede students’ learning if students do not know how to interpret visuals, to construct visuals, or to make connections among multiple visuals. These skills are commonly called representational competencies. My goal is to help students learn with visuals. To this end, I investigate (a) which representational competencies students need to learn new domain knowledge, (b) through which learning processes students acquire these competencies, and (c) how to design instructional activities that support these processes most effectively. A full list of Prof. Rau’s publications can be found here.